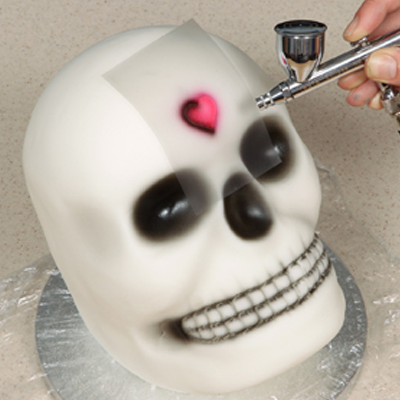 Airbrushing and cake decorating have long been successful partners. 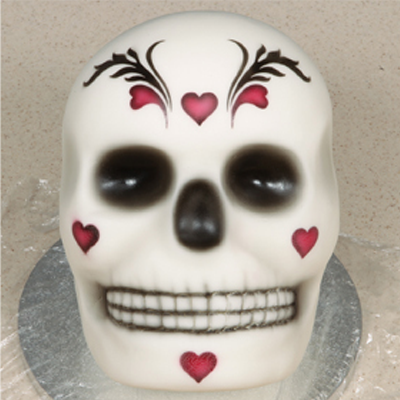 Whether it is decoration of a flat surface or applying colour to elaborate three dimensional sugar craft the airbrush represents a wonderful solution to colourful creativity. 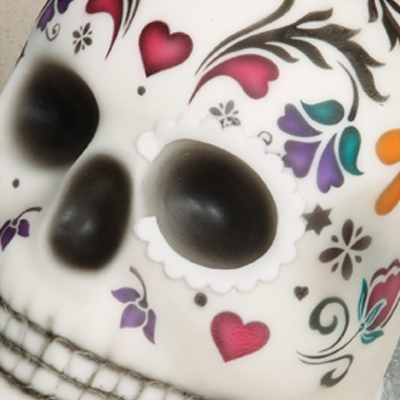 Day of the Dead is a Mexican holiday celebrated throughout Mexico with a full day of celebration in a carnival atmosphere. The holiday focuses on gatherings of family and friends to pray for and remember friends and family members who have died, helping to support their spiritual journey. 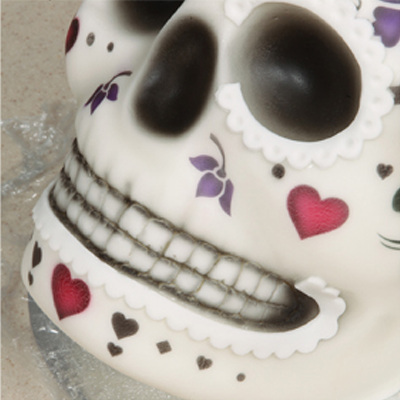 The easy to use Wilton 3-D Skull Pan teamed with the airbrush make the perfect match to this style of cake, without the need for sculpting. 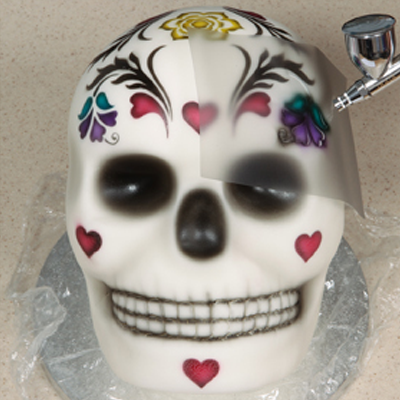 Lisa Munro also teaches courses for Airbrushing Cakes and Sugarcrafts. This hands-on workshop will cover as many basic techniques and airbrush effects as possible in one day. 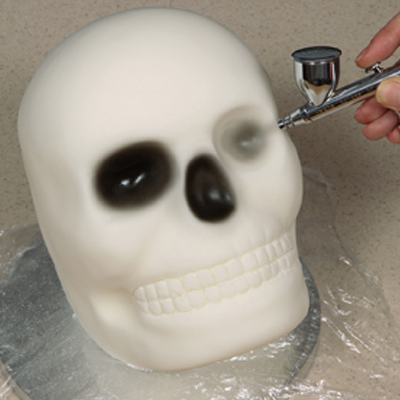 You will discover the airbrush as a versatile addition to your other sugarcraft techniques. 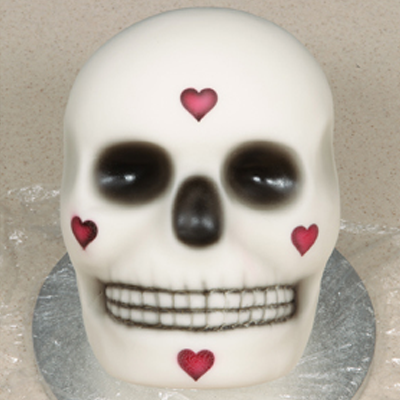 Using the Wilton skull pan, evenly proportion the mixture in 2 halves and bake. 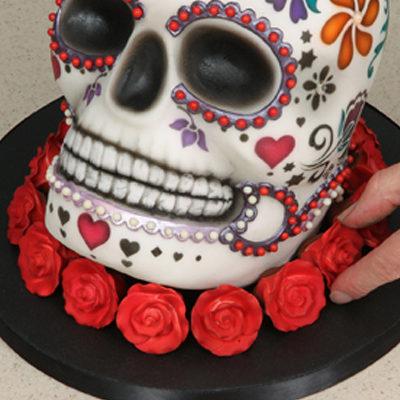 When cool, even the cakes by trimming along the cut line, add the filling of your choice and stick together. 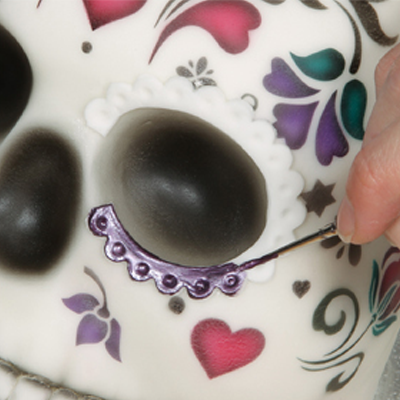 Coat with white sugarpaste in one go, smoothing over the indents for the eyes, nose, temples, teeth and jawline. Also coat a 10 inch cake drum in white sugarpaste. 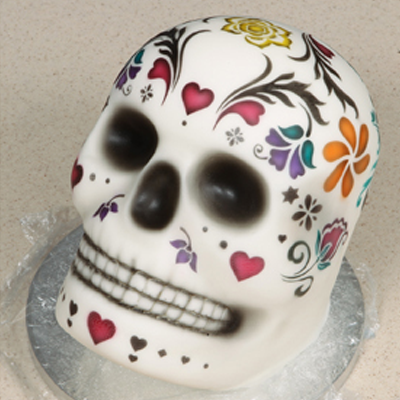 Alternatively, smaller versions of this cake design can also be made using the Wilton Mini 3-D Skull Pan as pictured. Step 1. Roll out a piece of sugarpatse about 3mm thick to the length of where the teeth should be. Immediately stick in place with edible glue and shape. 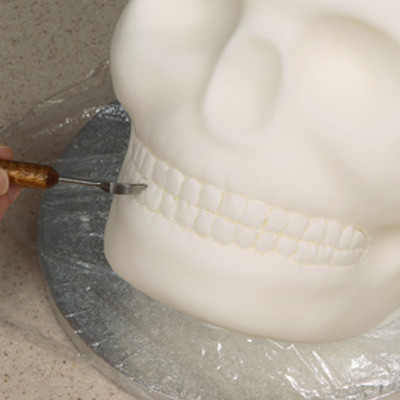 Use a sharp blade to scratch in the individual teeth, removing the surplus bits of icing as you go. 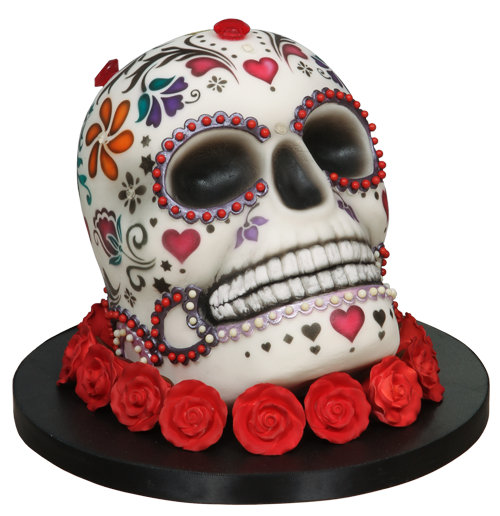 Tip: As soon as I had coated the cake in sugarpaste I placed it onto a spare cake drum covered in Clingfilm before airbrushing my design. 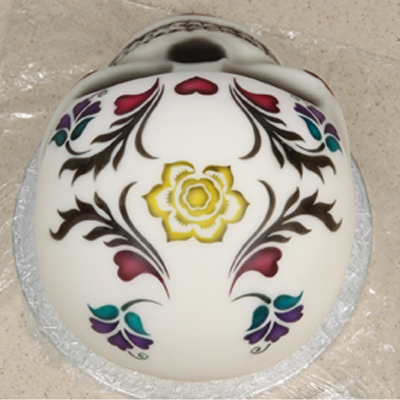 This meant I could easily remove the cake after I had finished airbrushing, before placing it onto the final drum. 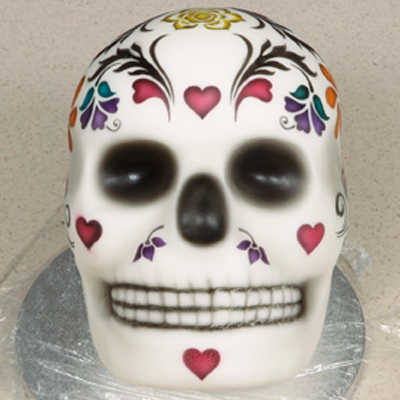 Add Black to the airbrush, position close to the cake and shade inside the indents for the eyes and the nose. Step 3. Position the airbrush really close to the outside of the teeth, pull back very light on the trigger and start to shade in around the teeth and either side of the jawline. Build-up in light layers so you don’t go to heavy. Tip: For a more realistic effect, ever so lightly shade in the where the temples are, creases around the teeth/jawline and the creases underneath the cheekbones. 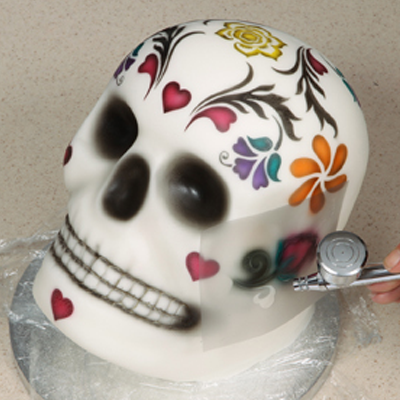 Add metallic black to the airbrush and positon about 3 inches away from the cake drum. Working from left to right, airbrush layer upon layer until you have achieved a dark black colour covering the entire drum. Tip: When using the metallic paint, always clean the airbrush out thoroughly after use – of its left in the bowl for long it could clog your airbrush! I recommend only using metallic paints through an airbrush with a 0.35mm or larger. nozzle. Place a sheet of Ultra Mask over the templates provided. Using a sharp craft knife cut around all of the outlines. You should be able to use each mask at least 2 or 3 times. Step 6. Starting with template 1, apply the sticky mask in the centre of the skull about 1 1/2 inches above the nose. Add Carnival Red to the airbrush, position close and spray inside the mask. Switch to black and carefully spray just around the outer edge of the mask. 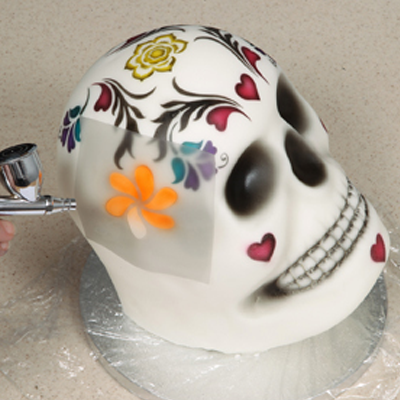 Tip: You may want to protect the cake from overspray using sheets of paper around the templates. Step 7. Repeat the last step of spraying through template 1, this time on either cheekbone and in the centre of the chin as shown. Step 8. Place template 2 to the left of the heart already sprayed in the centre of the skull. 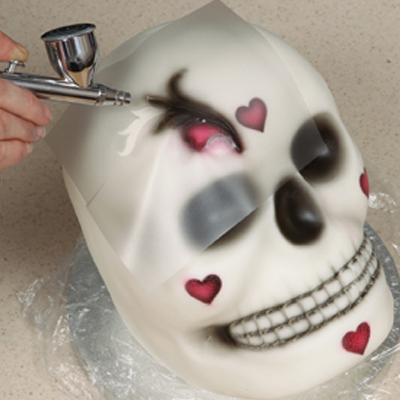 Add red to the airbrush, position close and spray inside the heart only. 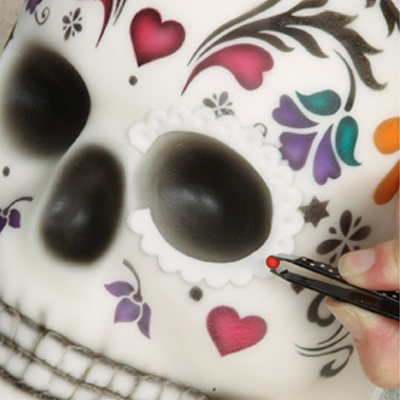 Switch to black and carefully spray just around the outer edge of the heart and in the rest of the mask. Step 9. Repeat the last step using template 3, mirroring the design on the opposite side to the heart as shown. Step 10. 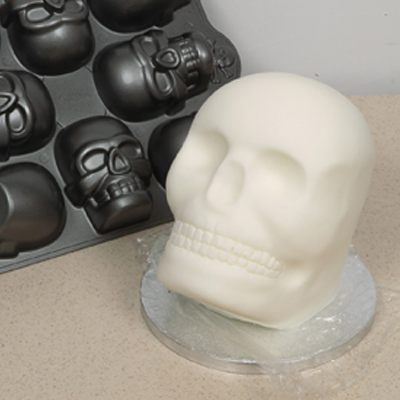 Repeat the last two steps using templates 2 and 3, this time mirrored to create a set of 4 on the top of the skull as pictured. On the second set I have actually left a slightly larger gap between the 2 masks where the yellow flower will sit. See step 12. Step 11. Place template 4 left of template 3, about 1 inch above the eye socket. Spray the leaves in Teal and the flower in Violet, then using black shade around the edges and in the top and bottom stems. Mirror this on the opposite side using template 5. Step 12. Mirror the last step using the same 2 masks with the same colours on the back of the skull. Line them up with the hearts as shown. Switch colours to Yellow. Position template 6 in the centre as shown. Airbrush inside the mask, then switch to black and spray just around the outer edges. Step 13. Add Orange to the airbrush, position template 7 just above the temple and spray inside the mask. Switch to black and carefully shade around the outline. 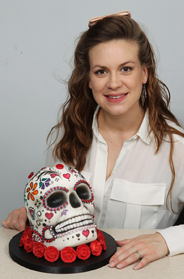 Repeat this, mirroring the flower on the opposite side of the skull. Step 14. Add red to the airbrush, position template 8 next to the red heart on the cheekbone and below the orange flower you’ve just sprayed. Spray inside the flower only. Spray in the leaves in teal, then using black shade around the outline and fill in the stem. 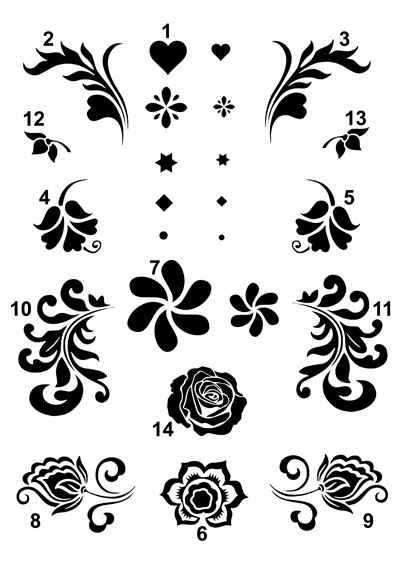 Repeat this using template 9, mirroring the flower on the opposite side of the skull. Step 15. Add teal to the airbrush, position template 10 the other side to the orange flower. Airbrush one side in teal, then switch to black and spray in the other side. Repeat this with template 11, mirroring on the opposite side of the skull. Step 16. Add violet to the airbrush, position templates 12 and 13 either side of the nose as shown. 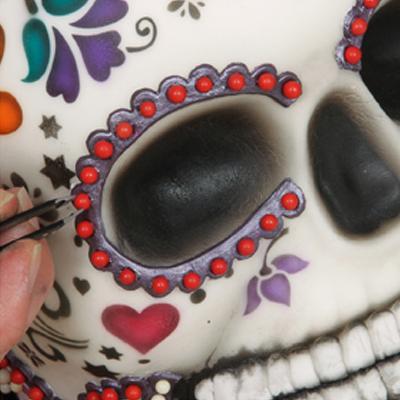 Spray inside the mask, switch to black and carefully shade just around the outline going in very close to the icing. Step 17. Using the rest of the templates provided, fill in any large gaps. I have used template 14 on the back of the skull, sprayed in yellow and templates 1 and 2 around the base of the back of the skull sprayed in black only. Use the templates of small hearts, diamonds, stars and dots around the eyes, temples and chin. 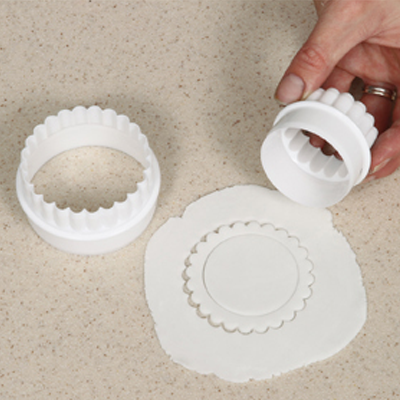 Roll out enough icing (3mm thick) to cut out the 68mm scalloped cutter – press the cutter firmly into the icing and remove surplus. Now use the 48mm cutter but pressing with the opposite side to cut out a round circle in the centre as shown. Do this twice. Step 19. Whilst still pliable, position around the eyes and cut a gap where the nose is using a craft knife. Remove and apply edible glue to the back and leave for a few minutes. 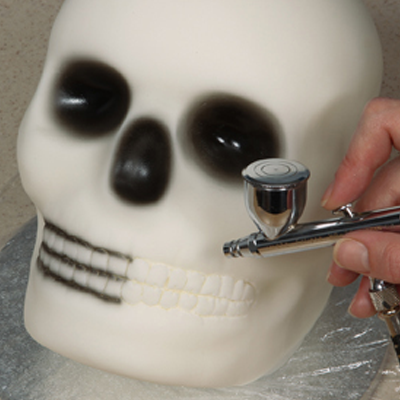 Stick around the eye socket. Step 20. Whilst the icing is still soft, use tweezers and an edible pearl (3mm thick) to make indents around the edging, this will help when sticking them in later once it’s painted. Step 21. Repeat the last 3 steps, this time using the 88mm scalloped cutter and the 68mm round edge to create the edging for around the lower section of the mouth. Glue in place and make the indents with the pearls. 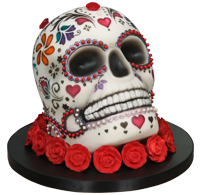 Tip: I have also carried on this scalloped edging around the back of the skull, to appear just above the roses that will be stuck on later. See photo 26 for example. Step 22. Using a fine paintbrush and violet metallic paint, carefully colour in the edging around the eyes. Paint in the edging around the mouth with lilac metallic paint. Step 23. 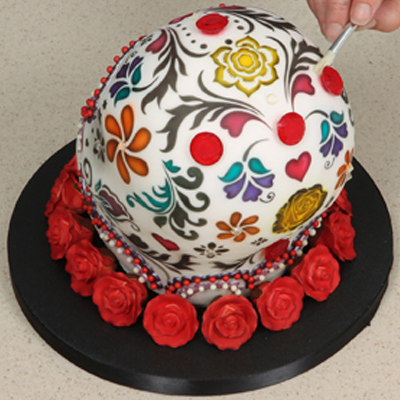 Place the edible pearls inside the indents using a pair of tweezers whilst the paint is till tacky so they will stick. I have used red pearls around the eyes, yellow around the mouth and a combination of red and yellow around the back. Add red to the airbrush, hold the rose upside down and start to build up the colour to a deep red on the underside of the rose. Then place the rose on a piece of paper facing upwards and build up the colour on the top petals to match the underneath. Step 25. 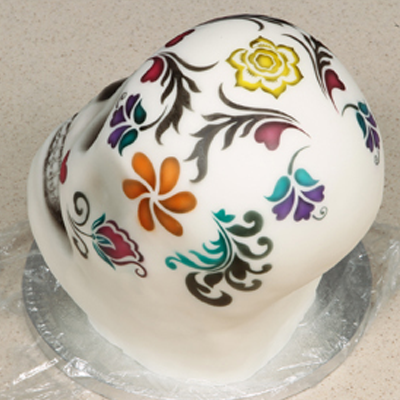 Apply a dab of royal icing to the centre of cake drum and carefully position on the drum. 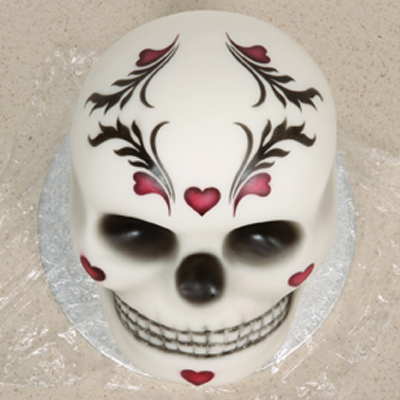 Stick the roses one by one to the cake drum so they wrap all the way around the base of the skull. Step 26. 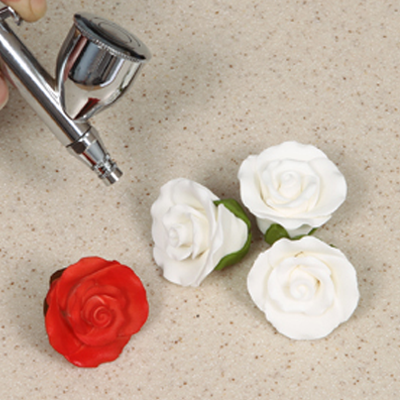 Using edible glue applied with a clean brush, stick large red and small clear edible gems in any gaps. As the large red gems I bought had a point on one side, I trimmed this point off with a sharp knife to create a flat edge to be able to stick them to the cake. Step 27. 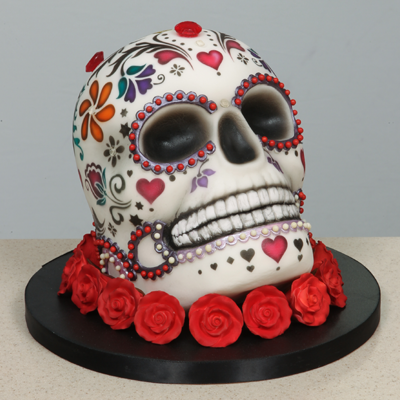 Finish by attaching a black ribbon around the cake drum. Alternatively you can use any colour of your choice for this. 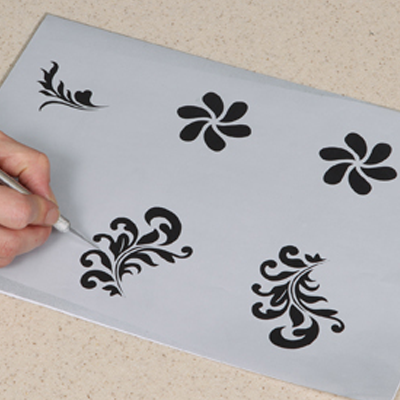 Practice first: Always practice using the airbrush on a piece of paper or kitchen roll first, cartridge paper has a similar absorbency to icing so this is a good substrate to experiment with. Mixing colours: You can mix colours straight into the bowl of the airbrush but it is a good idea to mix them into a dropper bottle if you want to use the exact same colour again. 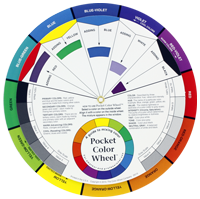 A colour wheel will also help when mixing colours. 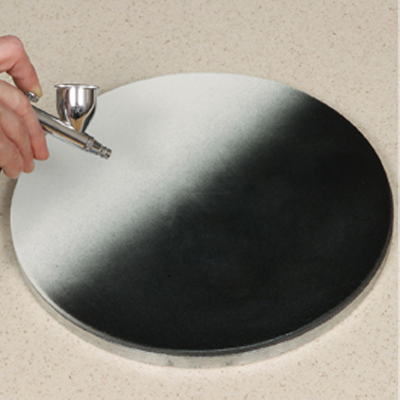 Turn as you spray: Place the cake on a turntable; this will help you to spray colours evenly whilst turning the cake at the same time. Cleaning between colour changes: It is not always necessary to clean out the airbrush between changing colours, simply flush through the excess colour and add in the next. However, stronger colours like black and blue do require cleaning out with clean water or airbrush cleaner first in order to remove any stubborn paint that’s in the bowl or around the nozzle and needle. Cleaning your airbrush: Cleaning your airbrush after every use is vital to its performance and longevity. Spray airbrush cleaner through the airbrush until the cleaning agent sprays clear. For more stubborn paint, use new cleaning fluid and a clean flat bristle paintbrush, gently wipe around the inside of the bowl and across the tip of the airbrush to remove any build up of dried paint. Remove the needle from the back of the airbrush and wipe off any paint before replacing. Masking Techniques: When masking off areas, make sure that you cover any area where you don’t want paint to land – scraps of paper work perfectly for this. Make sure there are no gaps and that the mask is securely fixed down to avoid any paint creeping underneath (known as under-spray).